AVAILABILITY JUNE 19 - 28 & AUGUST 22 - September 24 @ €600 Weekly / €86 Nightly IN June and after September 9, August €750 Weekly / €108 Nightly. 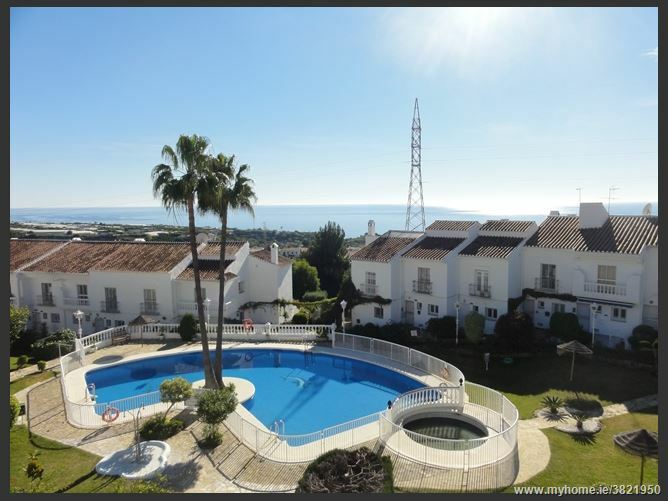 Stunning two bedroom townhouse in the beautiful development of Jardines de Nerja only a 5 minute from the town centre. 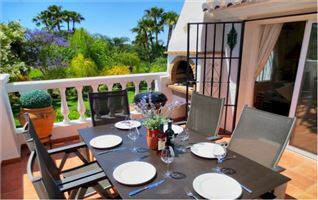 The property is furnished to a high standard and has the added benefit of a private south facing roof terrace and a second terrace on the ground floor with direct access via a small garden gate to the communal gated pools (large pool and baby pool) and garden area. WIFI & Aircon included in the rental price. 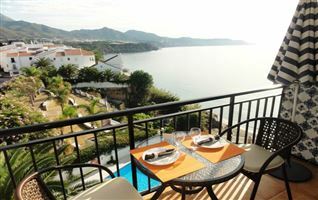 Ideal for a family holiday. 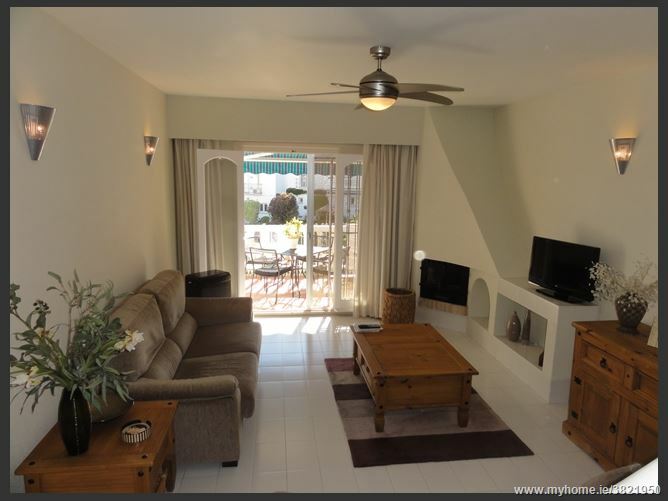 This property is in the ideal location for families wishing to enjoy a holiday in the sun. 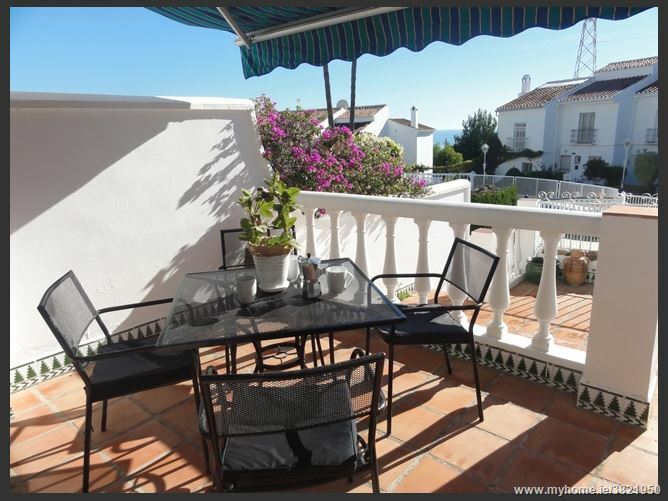 The property is built over three levels with a wide internal staircase. The ground floor comprises a cloakroom, modern fully equipped kitchen, large lounge/ dining room and double doors to the south facing private terrace from which you have access to the communal garden and pool via a small private gate. The wide stair case leads you to the first floor with two bedrooms and one bathroom and continues to the second floor to a fantastic large south facing private roof terrace. 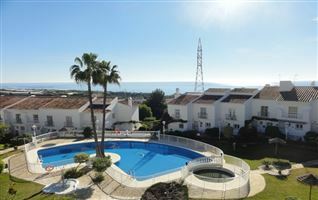 From there you have great views to the sea and down to the pools and garden area. Large three seater sofa, coffee table, side boards, open fire place, flat screen TV and DVD player, sliding doors to terrace, ceiling fan. 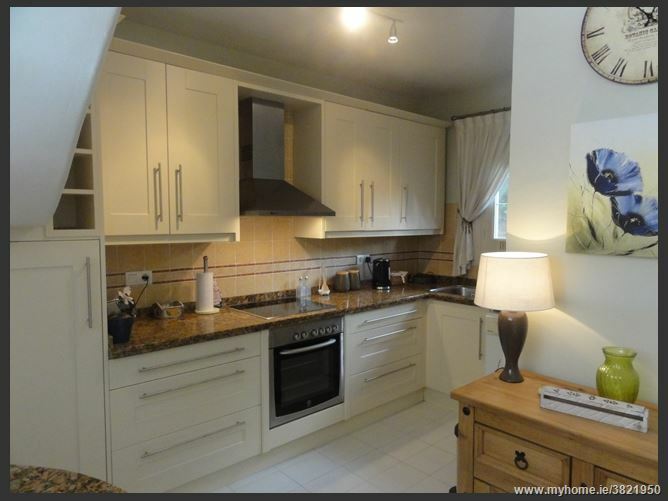 Fully equipped, electric hob and oven, extractor fan, dishwasher, fridge freezer, kettle, toaster, iron, ironing board, breakfast bar with bar stools. 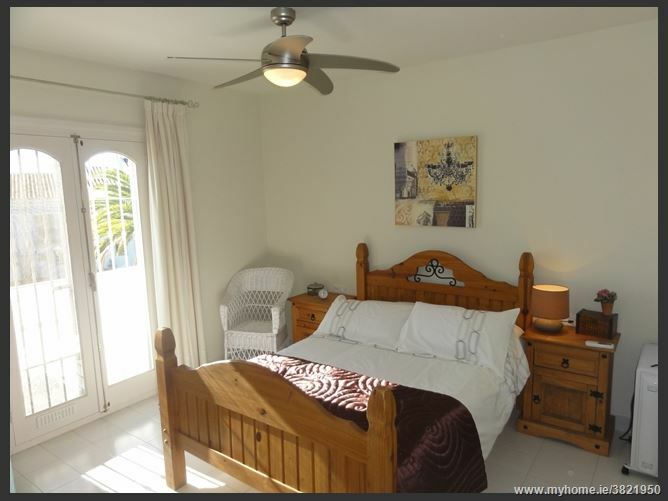 Solid wood double bed, bedside tables with lamp, chairs, ceiling fan, built in wardrobe, double doors to small balcony, freestanding radiator. 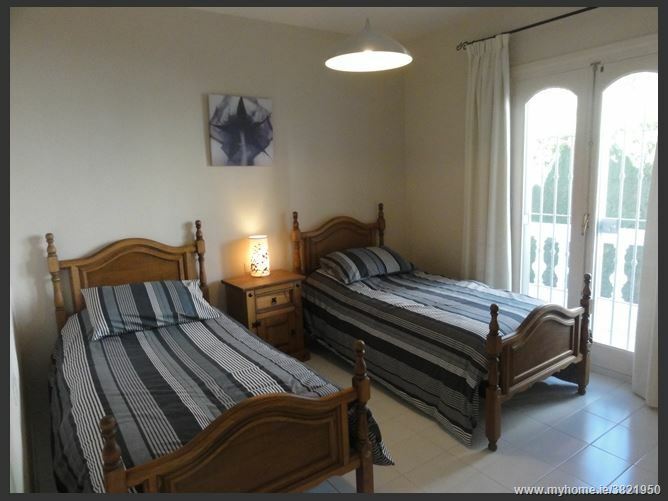 Twin beds, bedside table and lamp, built in wardrobe, double doors to small balcony. 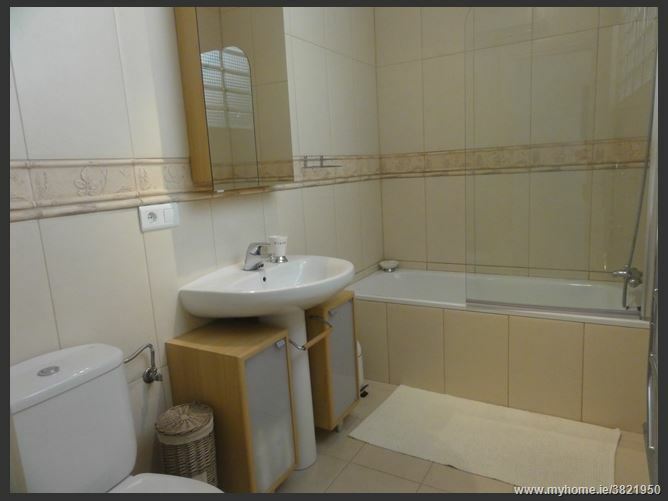 Free standing sink with two storage cupboards, WC, full lengths bath with glass shower screen and owner head shower, wall mounted mirror with shelving. 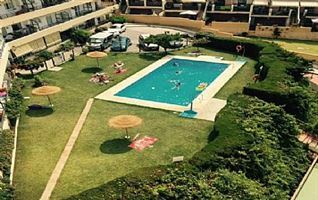 Communal gated pools, outside shower, parasols. Terrace - Table and 4 chairs, extendable awning. 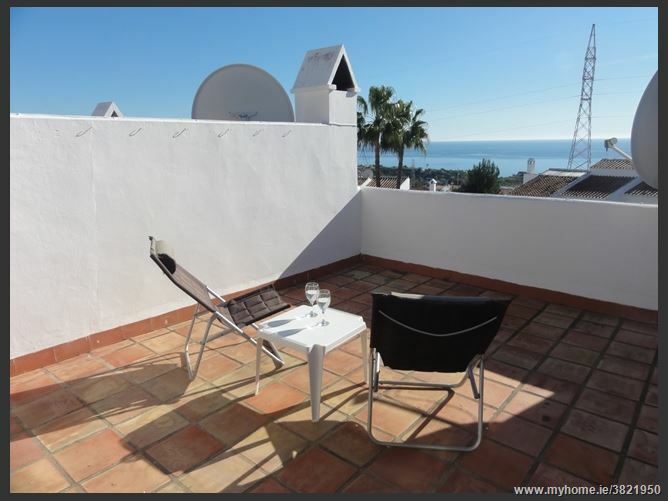 Roof terrace - Two sun chairs , low level table.